"This is a search for answers." Gravitas Ventures has released the official trailer for a documentary known The Bill Murray Stories, in full the title is The Bill Murray Stories: Life Lessons Learned from a Mythical Man. This premiered at the SXSW Film Festival earlier this year, though it hasn't stopped by too many other festivals. As the title suggests, the film is about the various random encounters that people have had with legendary actor Bill Murray. He'll randomly show up at parties or birthdays or soccer matches, staying briefly before disappearing again. The film attempts to examine why and what's going on and who Bill Murray really is, what makes him do this. It's an intriguing look at the one-of-a-kind mind of a legend. One man's journey to find meaning in Bill Murray's many unexpected adventures with everyday people, rare and never-before seen footage of the comedic icon partipating in stories previously presumed to be urban legend. 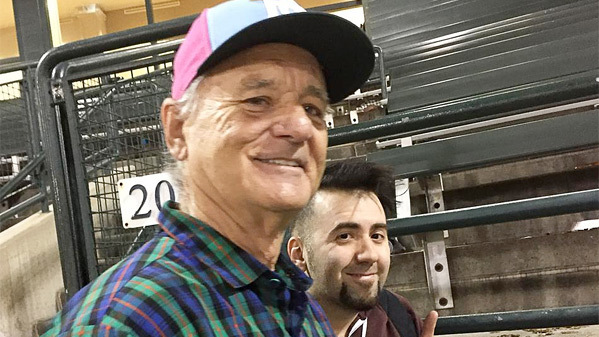 Whether it be singing karaoke late at night with strangers or crashing a kickball game in the middle of the afternoon, Bill Murray lives in the moment and by doing so, creates magic with real people. The Bill Murray Stories: Life Lessons Learned from a Mythical Man is directed by American actor / producer / filmmaker Tommy Avallone, director of the doc I Am Santa Claus and the film Community College previously. This first premiered at the SXSW Film Festival earlier this year. Gravitas Ventures will release The Bill Murray Stories in select US theaters + on VOD starting October 26th this fall. Interested?